Course climb is shown in the control description header in the rightmost of the three boxes just above the start. By default, the text shown in this box is entered manually in the Course dialog. However, Condes can also help you calculate the climb for a course. In order to do this, you need to measure the climb for each course leg on the course, and enter the values into Condes. Condes will then calculate the sum of the climb values for each course leg and use this value in the control description. The climb value for a course leg needs only be entered once, even when the leg is used on multiple courses. A checkbox in the Course dialog controls whether Condes should use a calculated value for course climb or the fixed text that you enter. You need to enable this feature individually on each course. 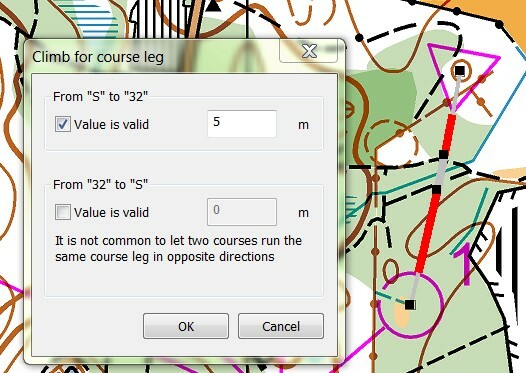 It is essential that you enter a climb value for each course leg: Select a course leg by clicking the mouse on it, then right click and select "Climb". In the dialog window that pops up, enter the climb value in meters for the relevant direction. The dialog allows you to enter separate values for climb in either direction. Under normal circumstances, it is not recommended best practice to use the same course leg in both directions. Nevertheless, Condes does allow you to enter climb for both directions.